Put bourbon, lemon juice and Atlanta Bourbon Ginger syrup in a shaker with ice and shake well. Garnish with candied ginger skewer. 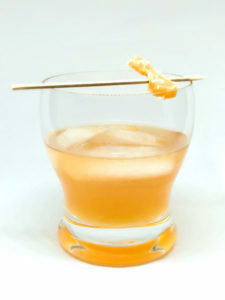 Note, do not put the candied ginger in the cocktail so that it does not soften. Atlanta from the Ashes (The Phoenix), is a bronze statue in Atlanta. The sculpture symbolizes the rise of the city from the ashes of the civil war to a cosmopolitan city. Inaugurated in 1969, the sculpture depicts a woman being taken out of the flames by a phoenix, in the style of the phoenix of Egyptian mythology, consumed by fire and risen from the ashes.